Few basic facts about our state have caused as much confusion or led to as much muddled thinking as the origin of its name. We can finally be confident that our state's name, supported by geological evidence, means "river running through a red place." "Wisconsin" (originally "Meskonsing") is the English spelling of a French version of a Miami Indian name for a river that runs 430 miles through the center of our state, currently known as the Wisconsin River. Recent scholarship has concluded that in Miami it meant, "this stream meanders through something red." In 2003, historical linguist Michael McCafferty convincingly argued that this was a reference to the red sandstone bluffs of the Wisconsin Dells. Oil painting by Frank H. Zeitler, 1921. Museum object ID 1982.448.1. 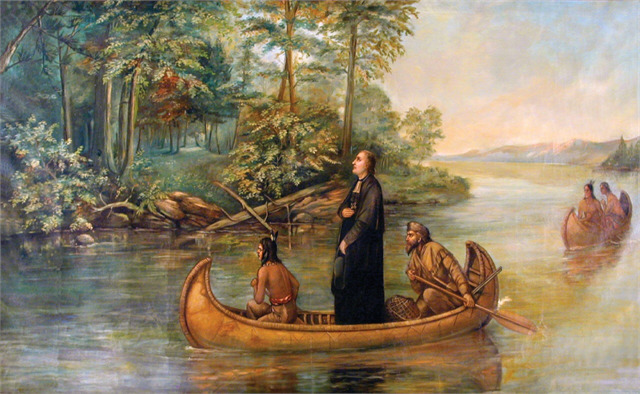 The river on which we embarked is called Meskousing," wrote Marquette. "It is very wide; it has a sandy bottom, which forms various shoals that render its navigation very difficult. This journal entry appears near the start of the trip made by Marquette and Joliet when they stayed several days with the Menominee Indians on Green Bay and then in a town of 3,000 Miami, Kickapoo and Mascouten Indians in Green Lake County. They left this village about June 10, 1673. Two Miami guides led them through the maze of the upper Fox River to modern Portage in Columbia County. There they crossed 2,700 paces of dry land to reach the long, westward-flowing river they would canoe until they reached the Mississippi. In his only other reference to the Wisconsin River, Marquette says that the Mississippi is "narrow at the place where Miskous empties." 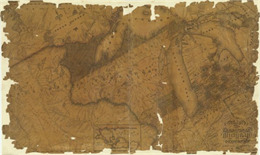 After they returned, Joliet used the name "Miskonsing" on a map that he drew in 1674. When the news of their voyage was first published in 1681, the book's author, Melchisedec Thevenot, called it the "Mescousin" River. On the east one comes first to the river called by the Savages Ouisconsing, or Misconsing, which flows from the east. Over the next two decades the letter "M" completely disappeared as writers and mapmakers always called the river by some version that began with a vowel. For the next 150 years the river, and by extension our part of the world, was known as "Ouisconsin." Sloppy printers sometimes turned this into Ouriconsing, Ouiscousen, and even Ouiskonche, but the "Ouis …" spelling was the one most often used by both French and English writers until the mid-19th century. Wisconsin: As American soldiers and officials traveled through the area for the first time following the War of 1812, they initially used the French spelling "Ouisconsin." But when large numbers of lead miners streamed into the area in the 1820s, the U.S. government began to refer to it differently in debates and legislation. These legal documents created by the government in Washington D.C., sometimes used the French spelling, but they gradually introduced the "W" and the uniquely American, "Wisconsin." 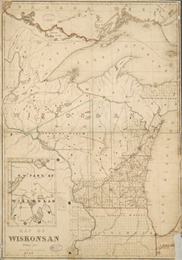 The U.S. House of Representatives Journal was the first to print Wisconsin in the February 1, 1830 entry during discussion of "laying out a town at Helena, on the Wisconsin river, in the Territory of Michigan …" In the five years that followed, the modern spelling was used with increasing frequency in government publications as well as in commercially published books and maps. 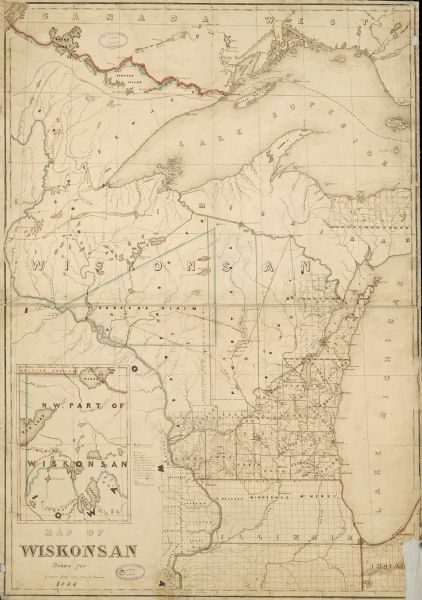 On July 4, 1836, when territorial status was authorized, we became officially "Wisconsin, although Canadian and French writers often used "Ouisconsin" until the end of the 19th century. Wiskonsan: Oddly, the person who did the most to create the Wisconsin Territory didn't like its name. James Duane Doty, who first visited the region in 1820, was the principal advocate for the spelling "Wiskonsan," which appears dozens of times on documents through the early 1840s. "During all this time, Governor Doty and the legislature were in constant hostility," wrote contemporary observer Theodore Rodolf. "One of the governor's vagaries had to be settled by a joint resolution. The governor had a fondness for spelling the name of the territory as 'Wiskonsan.' The Legislature, in order to avoid future embarrassments and misunderstandings, found itself obliged to declare by a joint resolution that the spelling used in the organic act should be maintained." During the 19th and early 20th centuries, many different meanings of the word Wisconsin were advanced. Most of them were founded on very weak evidence. For example, several writers interviewed elderly Indians, French residents, or fur traders who claimed it meant "Stream of a Thousand Isles," "Gathering of Waters," "muskrat house," "grassy place," and even "holes in the bank of a stream, in which birds nest." One of those researchers concluded in frustration, "I have not found two Indians to agree on the meaning of this word." 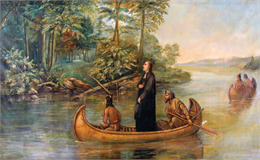 When the river's name was first written down, Marquette and Joliet had just visited the Menominee, Miami, Kickapoo and Mascouten. 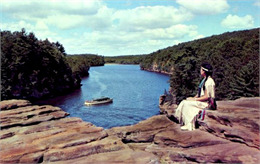 They had spent years with the Ojibwe, all of whom spoke mutually intelligible Algonquian languages. Their guides in the summer of 1673, who spoke the river's name to them aloud, were Miami Indians. The Miami nation left Wisconsin soon thereafter, and the last native speakers of the language died in the 1960s. The first historical research on the language was only published in 1991. What did Marquette's guides intend to convey by "Mesconsing"? Earlier, erroneous explanations focused on two slightly different Algonquian meanings supported by linguistic and geographical evidence. In 1935 native Ojibwe speakers recognized the three syllables as phonetic equivalents of "Misko" (red), "Ahsin" (stone) and "Sin," an ending that signifies a location or place. By this reasoning, Mesconsing / Ouisconsin / Wisconsin meant, "Red Stone River." Glossaries of Algonquian languages, including Ojibwe and Sauk, confirm that these syllables had the same meanings 300 years ago as they do today. In 1967 Edward Taube, a modern linguistics scholar, suggested that compressing those syllables as "Mesconsing" would have been very unusual. Instead, he hypothesized that the Algonquian word actually began as "Misi" (great) followed by "Ahsin" (stone) and "Sin" — or "Great Stone River" rather than red stone. The difficulty with this explanation is that a hard "K" must be introduced between the first two syllables that are not found in either "Misi" or "ahsin." This is something that other linguists find equally unusual. Both derivations mistakenly traced the word to Ojibwe instead of Miami, since in 1935 and 1967 no one had yet mastered the 17th-century Miami dialect. In 2003 Michael McCafferty, a specialist in the Miami language, published an article that combined historical and linguistic evidence to prove that the name's meaning was akin to the English phrase, "river running through a red place." More than 14,000 years ago, at the end of the last ice age, a melting glacier flooded the Baraboo Hills region of Wisconsin. The sheer force of the rushing rapids carved the surrounding rocks, creating a 430-mile-long chasm that would become the Wisconsin River. The flood deposited ancient sandstone, limestone and dolomite into the river and chiseled out steep sandstone cliffs and canyons along the river known as "The Dells." 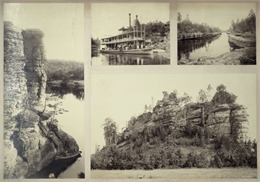 Geologists have found red sandstone as far north as the Wisconsin River's headwaters in Vilas County and noted that, around Wisconsin Rapids and Stevens Point, the rock color and texture was "a fine-grained to coarse-grained, pinkish to red rock …"
In the neighborhood of Fort Winnebago … the sandstone beds are horizontal, disintegrate easily, and are often variegated in color, having red, orange, and dark tints. Further down river near Prairie du Sac, in June 1819, Captain Henry Whiting saw "a hill 5 or 600 feet high … on the left bank of the river, on whose bald top are seen naked strata of a red stone which are so regular in their angles and projections as to resemble fragments of a stupendous wall, built for the purpose of defense." Thus, along much of its length, red-colored stone is a characteristic part of the Wisconsin River shoreline and confirms the appropriateness of the Miami word "Meskonsing." We can finally be confident that our state's name does not come from the oft-repeated "Gathering of Waters" or similarly romantic Victorian phrases that have been repeated with little regard for available historical or linguistic evidence. Our state's name, supported by geological evidence, means "river running through a red place." More than 60 books, manuscripts and maps produced since 1673 were examined in drafting this brief summary. Those quoted or referred to above, as well as the ones most useful for readers who want to explore the subject further, are listed below. Newspaper article by Rev. John Nelson Davidson, [Madison, Wis.] The Capital Times, May 4, 1935. Available in the Wisconsin Historical Society's Wisconsin Local History and Biographical Articles (WLHBA) Collection.